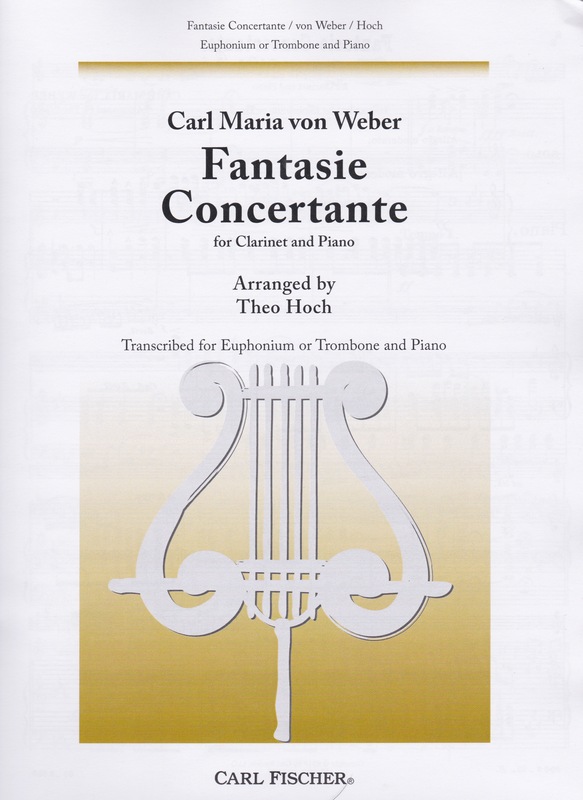 Fantasie Concertante in the style of Carl Maria von Weber was originally composed in 1902 by Theodor Hoch for solo cornet and band. This edition has been transcribed for trombone or euphonium. The cover of this version erroneously labels the work as von Weber’s Fantasie Concertante for clarinet and piano arranged by Hoch. The Carl Fischer website properly labels it as Hoch’s cornet composition in the style of von Weber. Hoch was a German born cornet soloist and composer who lived from 1842-1906. Further information on the composer is available in the Historic Brass Society Journal Vol. 19 (2007) p.71-101 by Edward Tarr. In addition to his playing career, which gave him a substantial amount of fame both in Europe and the United States, Hoch also composed a number of works, primarily for cornet solo and accompaniment. As the title suggests, the work is homage to von Weber in style and structure, showcasing the technical abilities of the cornet soloist. It is also similar in style and structure to the Herbert L. Clark and Arthur Pryor solo compositions. After a technical introductory cadenza the original theme in a lyrical style appears. It is followed by another cadenza, again showcasing the technical prowess of the performer. The second half of the work is theme and variations. A short cadenza after the second variation leads to the coda, which is reminiscent of Pryor’s Blue Bells of Scotland and Arban’s Carnival of Venice with the melody notes accented amongst repeated mordents. The entire work comprises 7:45 with a short piano introduction. As a cornet solo, the work lays well for euphonium. Range and technical aspects are well within reach for the college or professional euphonium player. On trombone the piece becomes much more challenging. The slide technique necessary is advanced. The piano and solo parts are clear and easy to read with no page turns. For those performers looking for a quality alternative to Arthur Pryor or Herbert L Clarke showcase solos, Fantasie Concertante fits the bill. Since it is over 100 years old it does not break any new ground, but it is a quality addition to the repertoire.